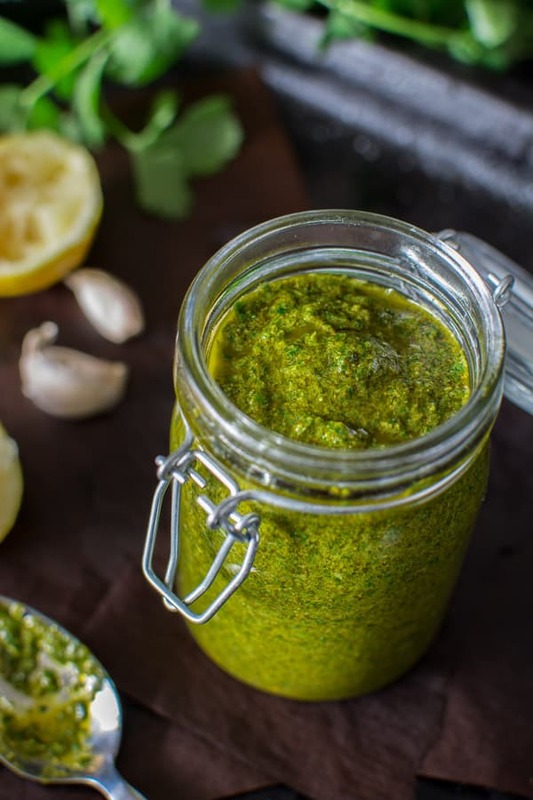 This oh-so-flavorful and tangy Moroccan Chermoula Sauce will serve as a healthy addition to your seafood, poultry, meat, and vegetable dishes. 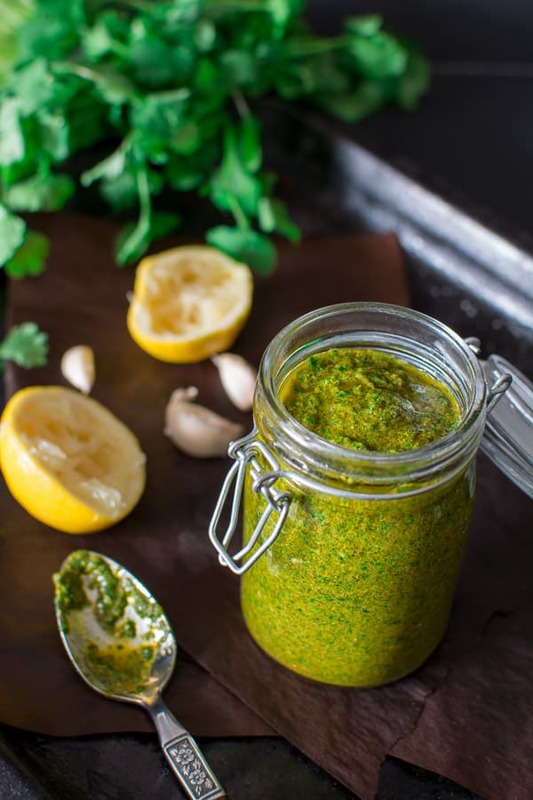 Chermoula Sauce is easily one of the most flavorful and versatile sauces out there. Made with simple ingredients, this wonder-sauce can be used in so many recipes. I use it to marinate meat and fish, and I like to add a spoonful to roasted vegetables and soup. 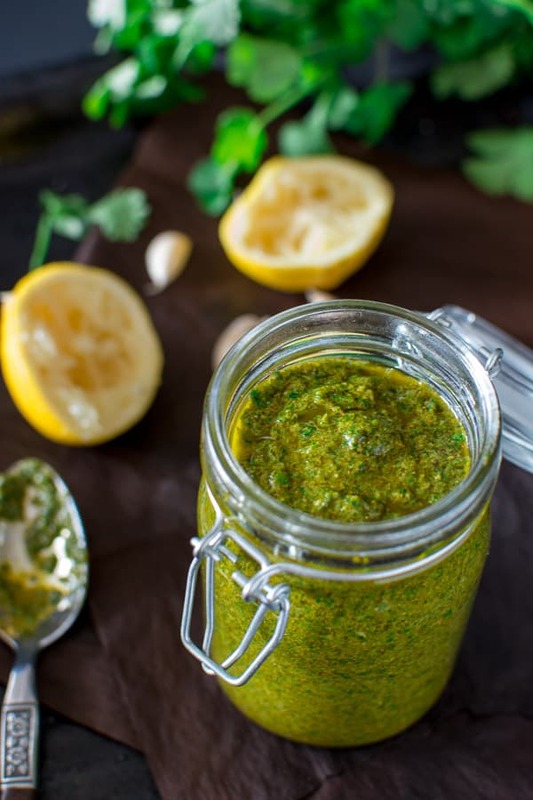 Chermoula is a flavorful sauce that is popular in North African countries. It pairs well with fish, seafood, meat, poultry, and vegetables. 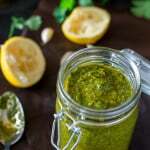 There are many versions of Chermoula Sauce, some are spicier that others, but all very tasty. The recipe I am sharing today comes from a book called “Step by Step Mediterranean: More than 250 Recipes.” I have tried several other versions of this sauce, but every time, I came back to this one. Fresh Parsley. Flat-leaf Italian parsley works best. Extra Virgin Olive Oil. Use good-quality olive oil for the best results and health benefits. Lemon juice. Can be substituted with lime juice, if preferred. Ground spices. Cumin, coriander, and paprika. You might already have paprika on hand, but I am not so sure about the latter two. You can easily find ground cumin in most grocery stores, and ground coriander can be found in larger grocery stores and in Indian stores. If you don’t feel like browsing the stores and looking for these spices, here are some Amazon links for you: ground coriander, ground cumin, paprika. 1. Place the cumin, coriander, and paprika in a frying pan and cook over medium heat for 30-60 seconds, or until fragrant. 2. Combine these spices with the rest of the ingredients and pulse in a food processor until smooth. Yes! Especially if you use high-quality extra virgin olive oil, and organic herbs and spices. This recipe is Whole30 compliant, low carb, keto-friendly, vegan, gluten-free, and dairy-free. How long will Chermoula Last in the Fridge? This wonderful sauce stores really well (up to 3 weeks in the refrigerator), so you’ll have plenty of time to eat it all. Keep it in a mason jar covered with a lid. Chermoula Sauce can also be frozen, although I don’t see a reason to since it’s so easy to make it fresh. With Fish. Spread a spoonful of Chermoula Sauce on top of your favorite fish. Let it marinate for a couple of hours or overnight. Place the marinated fish on a baking dish, and bake until cooked through. With Shrimps. Sauté the shrimp with olive oil for a couple of minutes. Add some Chermoula Sauce to the skillet, and cook for another minute. With Chicken. 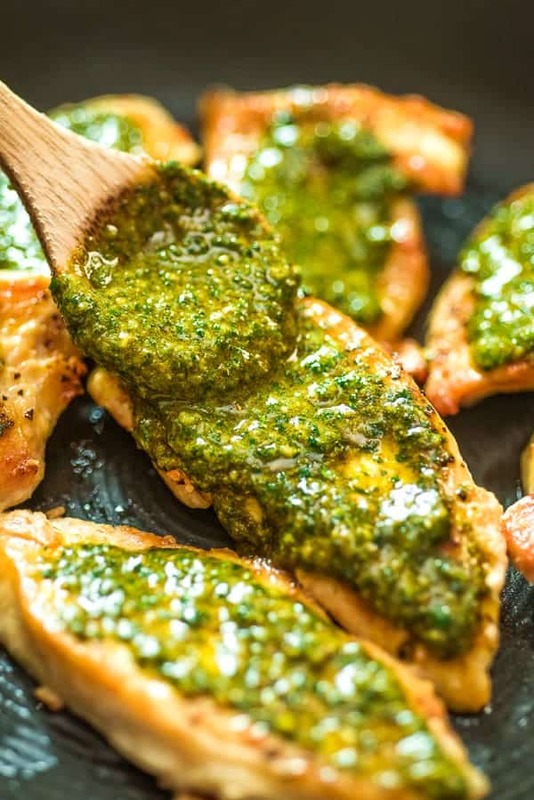 Pan fry or bake the chicken, and top it with fresh Chermoula. With Couscous. Cook the couscous according to the package instructions and stir in a spoonful of Chermoula. With Orzo and Feta. Cook the orzo according to the package instructions. Stir in a spoonful of Chermoula and some crumbled feta cheese. With Tofu. Pan fry the tofu “steak” and top it with a generous amount of Chermoula Sauce. With Roasted Vegetables. Roast your favorite veggies, and mix them with Chermoula. Check out my Oven Roasted Vegetables recipe! Make Chermoula Work for You! As with most homemade recipes, you are free to make some substitutions depending on your taste. If you are not a fan of cilantro, use more parsley instead. Add some extra cayenne pepper to make it spicier, or some extra garlic for that amazing garlicky taste. This oh-so-flavorful and tangy Moroccan Chermoula Sauce will serve as a healthy addition to your seafood, poultry, meat and vegetable dishes. Place the cumin, coriander, and paprika in a frying pan and cook over medium heat for 30-60 seconds, or until fragrant. 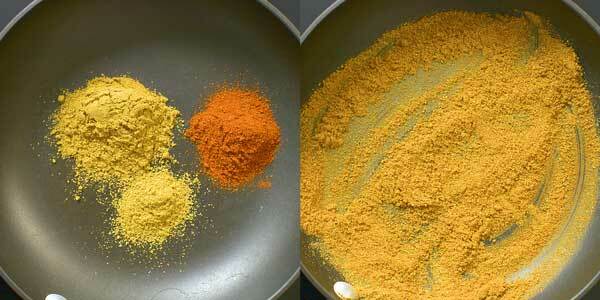 Combine these spices with the rest of the ingredients and pulse in a food processor until smooth. 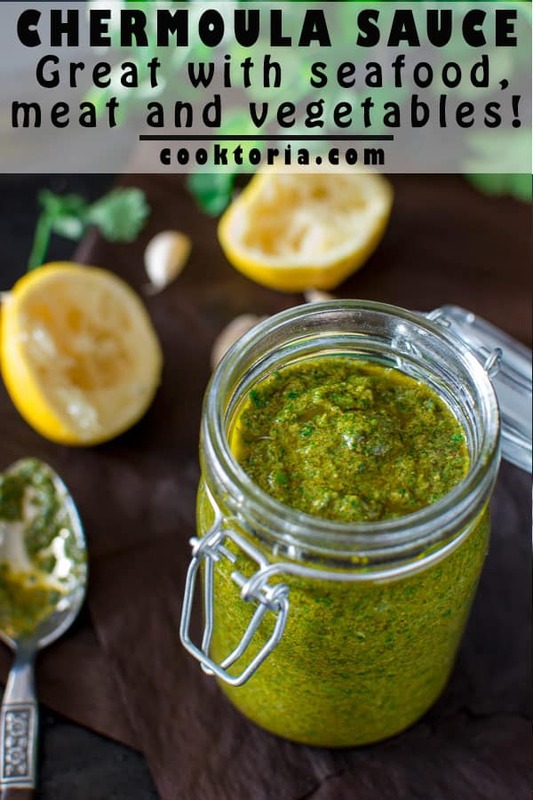 The post CHERMOULA SAUCE appeared first on COOKTORIA.